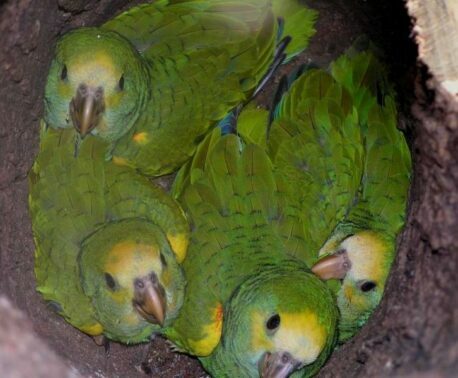 The Endangered Yellow-shouldered Parrots of Margarita Island have had a late and difficult breeding season this year, with a poaching raid early in the season destroying nests and taking day-old chicks. The chicks are stolen for the pet trade in Venezuela and smuggled overseas, and are most vulnerable to poaching before they have fledged. They are also in danger of being predated by Robinson’s Mouse Opossum, so World Land Trust partner Asociación Civil Provita has set humane traps around the nests and captured individuals are relocated away from the nests. A total of 20 nests were damaged by the poachers, which Provita’s Keepers of the Wild have repaired, using mesh, plaster and non-toxic dye to make the nests look as they did before the looting. 14 of these nests were soon occupied again with breeding parrots, but the rangers noted lesions on juvenile parrots, which were most likely caused by stressed females after the event. 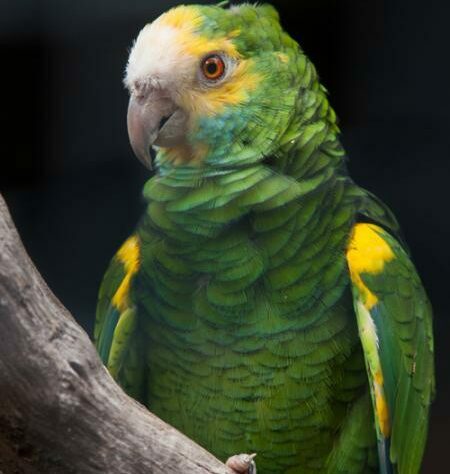 The Ministry of Eco-socialism and Water then confiscated five parrot chicks from poachers, which were brought back to Provita and reintroduced into foster nests under heightened ranger protection. Provita believe this might have been avoided if more rangers had been employed to guard the nests, but resources to keep the chicks safe in Venezuela are limited. WLT supports the salaries of the Keepers of the Wild who protect Yellow-shouldered Parrots, and with your help we can support more rangers protect wildlife from poachers.